If you read any menswear content, you've probably read about thirty articles on the navy suit and how it's the most important thing in a man's wardrobe. With that navy suit you're told to buy a navy or a burgundy grenadine tie and a white linen pocket square. 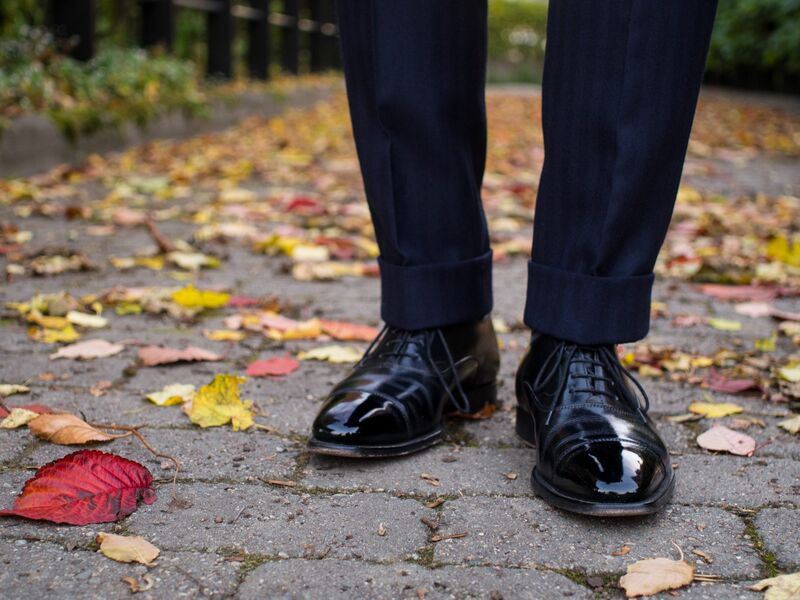 Finally, it's the black cap toe Oxfords that make the menswear starter pack complete. And while all these are perfectly valid tips, I personally quite rarely wear a combination exactly like this. Today's post is, however, perhaps the closest I go to that formal business wear archetype. 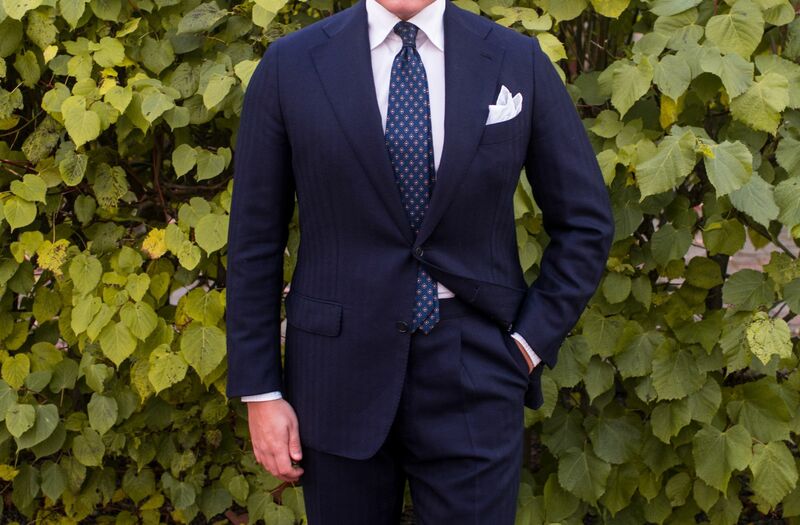 I'm wearing a Lardini wool coat with hand-altered unstructured shoulders, Berg & Berg wool scarf, Viola Milano 5-fold silk print tie, Simonnot Godard artisan pocket square, Luxire mtm shirt, Albert Thurston braces in navy and black leather pieces, Berg & Berg socks and Wildsmith Sloane Oxfords. 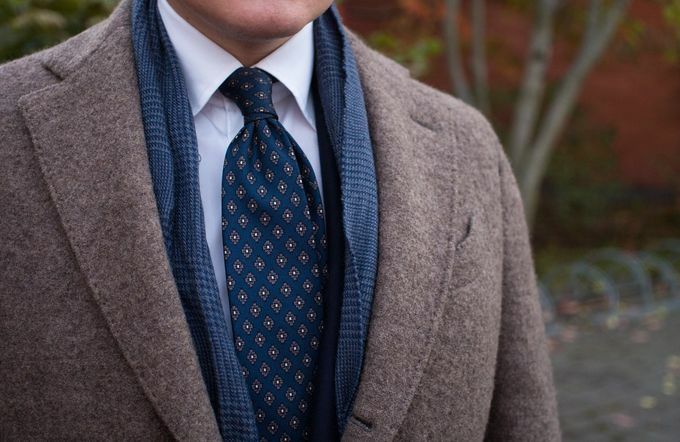 I love a slightly more free form tie knot and actually tend to wear one nowadays very often. A knot like this brings out the beauty in beautiful handmade ties that have the best materials that have been combined in the most optimal way. For example, Viola Milano's 5-fold artisan ties tend to create very beautiful knots like this, ones that also slightly different every time. 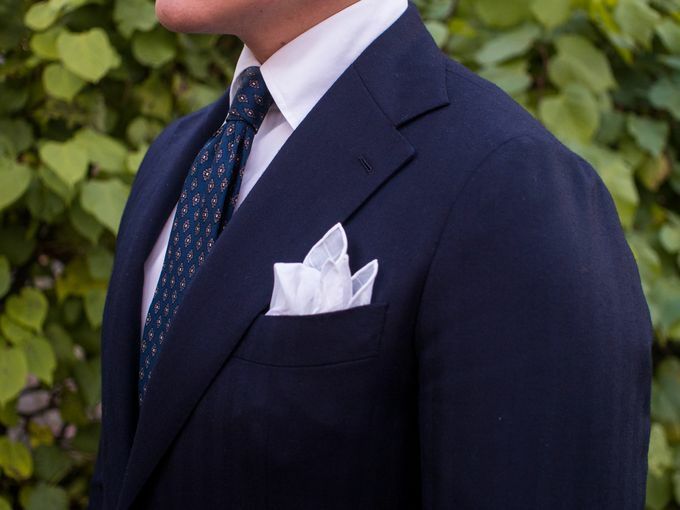 A bit more "vintage" white cotton linen pocket square is a fantastic detail in a very restrained and classic business look like this. 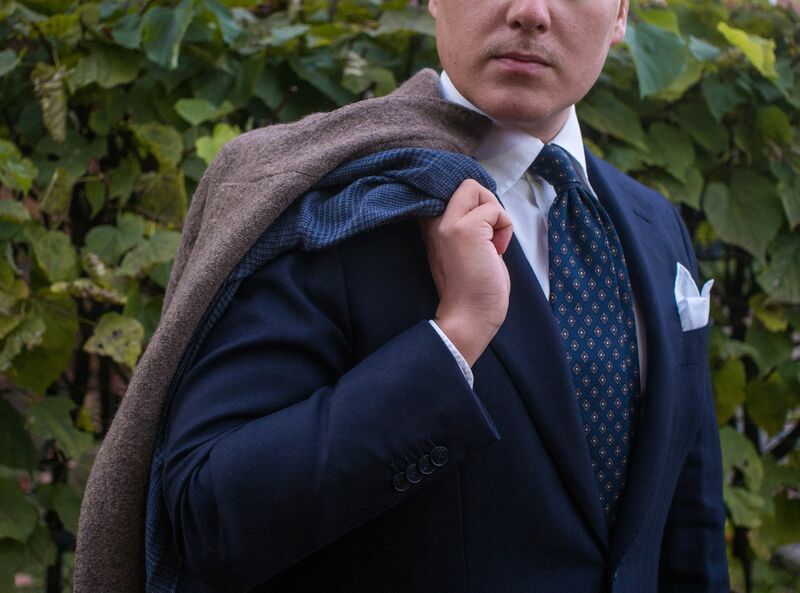 The faint texture in the fabric combined with a nonchalant fold like this works great as basically the only eye-catching detail in an outfit like this. 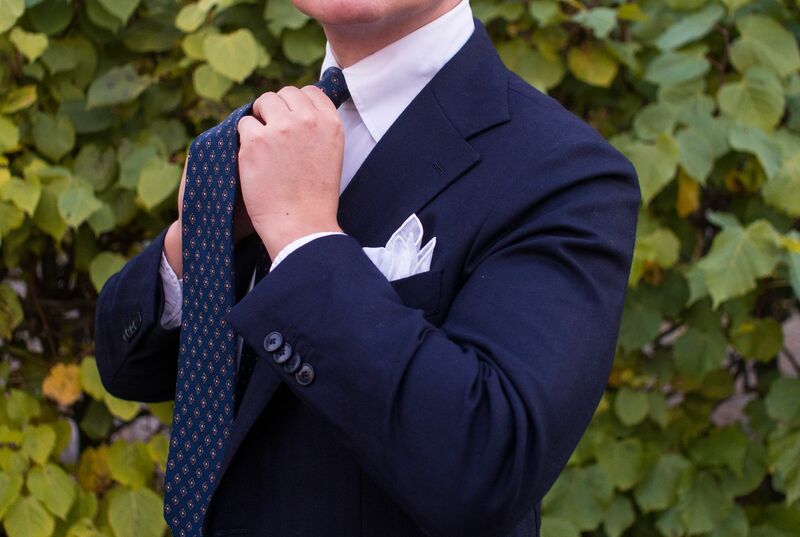 All navy and white with some black and grey. 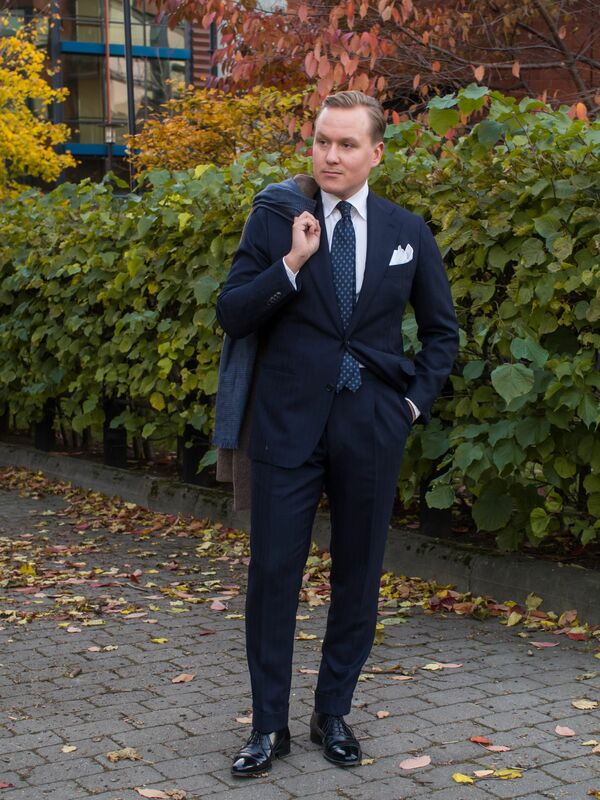 Finally, a slight polish does wonders to the overall impression a formal outfit like this presents. Make sure your shoes are at least well-cleaned, and if possible add a layer of Saphir if you can spare an extra 30 seconds.